What does a presidential candidate do when The Donald grabs every headline and Hill publicly steals every news cycle with yet another missing e-mail malapropism? The answer: Make ridiculously absurd comments in the hope that one, or more, may actually see the light of day in some obscure media outlet. Consider the recent antics of New Jersey Governor Chris Christie who, next to William Howard Taft, may be America’s most plus-sized candidate in more than a century. Dismissing his girth as a decided liability (i.e. Will this guy’s heart hold up during four stress-filled years in the Oval Office? ), Candidate Christie just launched an assault on climbing walls. Yes, climbing walls. The big fellow recently lambasted the University of New Hampshire for building a climbing wall for its students. “You have rocks. Right out there,” the sedentary one said. “What the hell do you need a rock climbing wall for? Tell the kids at UNH, ‘Go outside and climb those rocks! '” Sounds positively Reaganesque, doesn’t it? But, big Chris wasn’t done climbing this highly-relevant voter issue. He went on to say there’s a rock climbing wall EPIDEMIC going on at college campuses. Who knew? I, for one, sure hope the CDC is monitoring these outbreaks. Who needs another Ebola crisis? Christie verified his epidemic alert by pointing out that Notre Dame has two climbing walls, Princeton has one and even Iowa State University has built one. Why can’t those damn Iowa kids find themselves a healthy corn field and scale the stalks! Indoor climbing gyms have become Christie’s strategy to re-direct the illegal immigrant conversation. Talk about being in-touch with voter issues! Big Chris obviously knows how to navigate the shark-filled political waters of Trenton, but I’ll bet my last ice pick, he’s never attempted climbing New Hampshire’s Crawford Notch, AKA Frankenstein Cliffs, in January. If he had, he’d understand why climbing walls are an absolute necessity in northern climes. Then, of course, there are the obvious fitness benefits that accrue to rock, ice and alpine climbers. Trust me; whether it’s indoor or outdoor, climbing is tough. All of which makes Christie’s remarks so bizarre. He thinks colleges are spending too much money building climbing walls. I’m guessing he feels the same way about indoor swimming pools for student athletes. After all, there are plenty of lakes and rivers in New Jersey, New Hampshire, Indiana and Iowa, and who wouldn’t want to practice the 100-yard breaststroke dodging ice floes on the Delaware River? I applaud Governor Christie for re-directing the political conversation and identifying a whole new class of self-entitled individuals who are gaming the system. 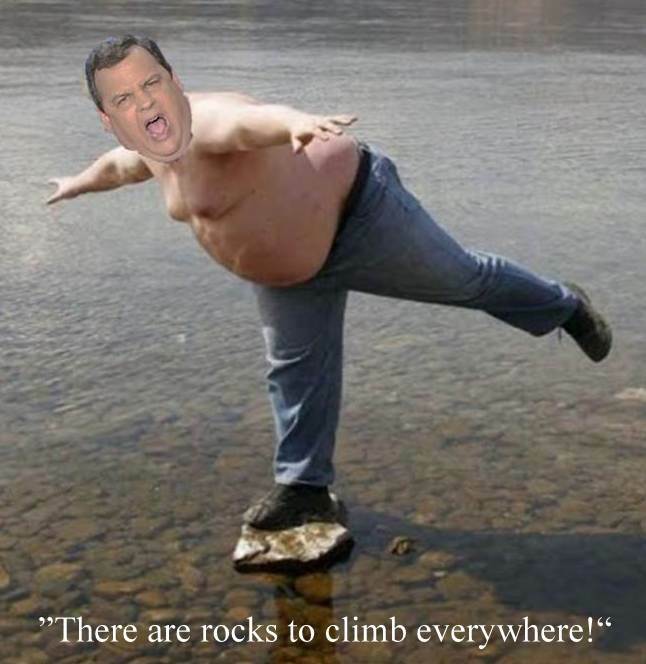 That said, I do advise Christie to experience a climbing wall before he identifies them as America’s latest, and perhaps, most insidious epidemic ever. But, you won’t catch me belaying the big fellow. I doubt the NYJets starting offensive line would be able to get much light between the governor’s climbing shoes and the first foot hold on a climbing wall. And a click of the carabiner to Adel Barr, the mayor of Handsomeville, for this idea.